Linking Nominal Accounts in Kashflow with Accounts in CommuSoft tells the software where to put the data. Without this stage, attempting to send data from CommuSoft to Kashflow will fail, because it does not know where to send it. Firstly we need to link our CommuSoft Bank Accounts with our Kashflow Bank Accounts. Once you've got your Account IDs you will need to match these up to CommuSoft. Login to CommuSoft and click Purchasing in the top right corner. Click Setup Account in the grey navigation. Click 'Edit' next to the Corresponding Account. We need to link our CommuSoft Sales Accounts with our Kashflow Sales Accounts. 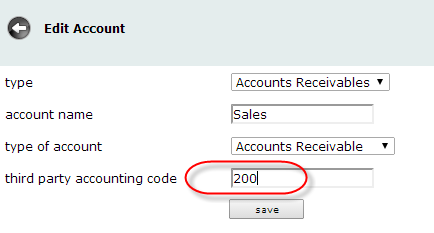 To find the ID Number that you require, click on the Account's code from the list. With this ID go to your Setup Accounts page in CommuSoft. Click Edit on the sales/accounts receivable account you wish to link with Kashflow. Your Sales Account will now be linked with Kashflow. We need to link our CommuSoft Expense Accounts with our Kashflow Expense Accounts. Go through exactly the same process as you did for Sales, but choosing the Expense Accounts rather than the Sales Accounts. Repeat the process for all accounts, whether bank, expense or sales.